Outlook will be included with version 8.1 of Windows RT, known previously as Windows Blue, Microsoft announced at the Computex trade show in Taipei on Wednesday. The update is due later this year as a free update to Windows 8. "We've listened, we've learned, and we've responded," said Tami Reller, Microsoft's CFO and chief marketing officer, who announced the change during Microsoft's keynote speech at Computex. Windows has traditionally run on x86 processors such as Intel's Core chips, but most popular smartphones and tablets, including Apple's iPad, are based on low-power ARM chips from the likes of Qualcomm, Samsung and Nvidia. With the release of Windows 8, Microsoft added the ARM version to help it compete better with Apple's iOS and Google's Android. Support for Windows RT from hardware makers has been limited, however, with several PC makers, such as Acer and Hewlett-Packard, not yet supporting the OS. Microsoft hopes to change that by addressing one of the criticisms of Windows RT -- that it doesn't include a version of its popular Outlook email client. Nvidia CEO Jen Hsun Huang has been vocal about the need for Outlook in RT. His prayer has been answered. In addition to the Home & Student 2013 version of Office, which has Word, PowerPoint, Excel and OneNote, Windows RT 8.1 will also include Outlook, Reller said. 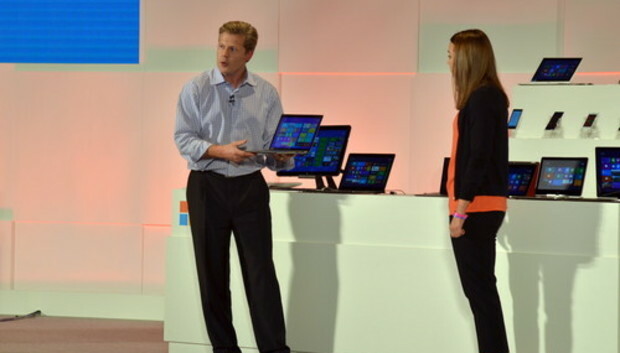 Microsoft will also add the Home & Student edition of Office to the x86 version of Windows 8.1, too, Reller said. The list of bundled apps for the x86 version does not include Outlook, however, so PC makers who want to include that will still need to license it separately. In both cases, the offer applies only to tablets with 7- to 10.1-inch screens, Nick Parker, the head of Microsoft's OEM business, told reporters after the keynote. It remains to be seen how much the change will boost sales of Windows tablets. Some users were jolted by the big changes in Windows 8, including its Metro interface, and Windows 8.1 is a move by Microsoft to address those criticisms. Like the RT version, the Windows 8.1 update for x86 PCs is also due later this year. Microsoft has said it will deliver a preview version of Windows 8.1 at its Build conference later this month. It disclosed some of the changes in Windows 8.1 in a blog post last week, and at Computex demonstrated them for the first time. Among them, Windows 8.1 will let users use their desktop wallpaper as the image that appears behind the application tiles in the Start screen of the new Metro interface. That makes switching between the Start screen and the more classic desktop mode less of a jarring experience, because the background image stays the same. Microsoft got a small cheer when it showed that feature. It also showed a new page for viewing and organizing apps, and a new search tool that looks through files on the PC as well as searching the Web, and presents the results side by side in a new interface. It posted a video of the new features in a blog post.